This week I have decided to eat only vegetables, fruits and proteins (nuts, meat, cottage cheese, eggs, plain yogurt). I will have nothing with sugar or honey. I am doing this because I have been researching that sugar can contribute to acne and because I have felt out of shape lately. I want to have more energy. I have also noticed that food has become the thing that I look forward to most in my days and I do not like that. This is the close of Day One. It has been difficult. One of the hardest moments of the day was gazing across the table at my friend's Rueben sandwich oozing cheese onto the plate. Ruebens are my favourite sandwich. Because I cannot particularly look forward to food and mealtimes I am trying to focus on other parts of the day to look forward to. This is kind of a funny one, because it seems like it should be a routine and banal thing to cross off the list for getting ready in the morning. But I have been really enjoying experimenting a little with this. I am a little shy to admit it but I am addicted to certain makeup YouTube channels that are hosted by young women. This addiction started in 2012. I just found them comforting and they inspire me to beauty and experimentation in my personal style. Liz Meghan: She's a sweet girl and I don't even know why I follow her. Her style is totally different from mine. She is a girly-girl. I guess I feel safe when I enter her world of make-up and hairstyles. Anastasjia Louise She's funny and has a great style. I love her outfit ideas and thrift hauls. I love doing this but I never make enough time to do this. I want to write a Birthday Card for my dear friend Barbora. 1) Gently use Sephora face brush to scrub face all over. 2) Use a creamy face wash and makeup remover to clean face, neck and chest. I use this. 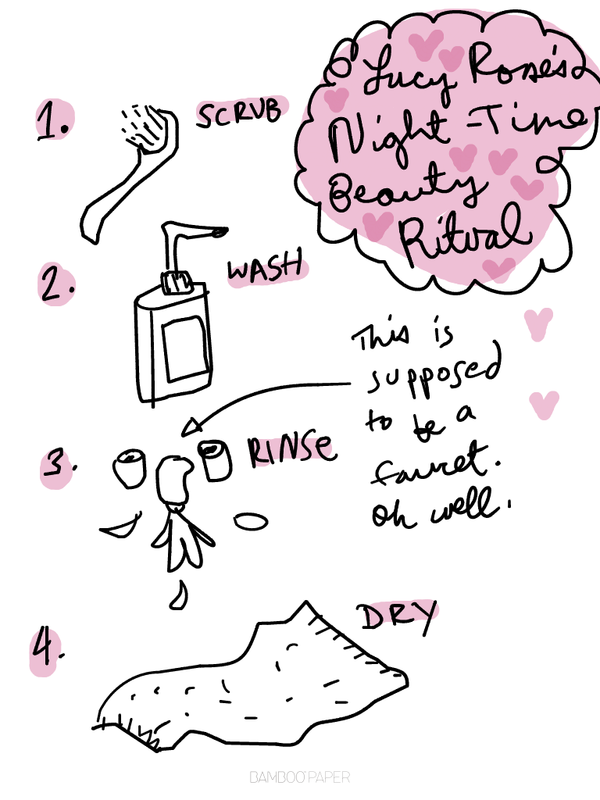 4) Dry face with clean face towel. I got mine from Walmart. Classy. 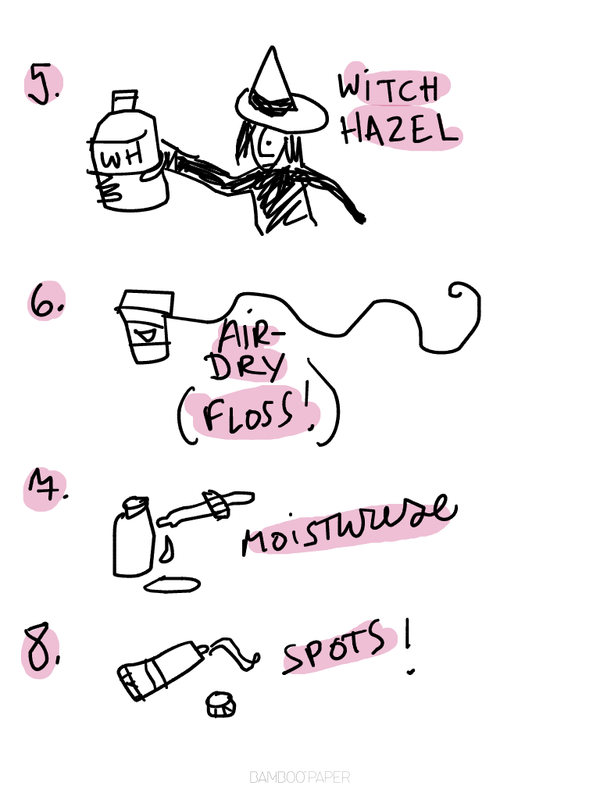 5) Splash face with a handful of witch-hazel toner. 6) Air-dry. Use this extra time to floss! Fun! I like to use an unravelled sweater. Just kidding. But that reminds me of the the other day when one of the little boys came home with one-and-a-half socks on his feet. When I asked him what had happened to the top part of his sock he told me that he had systematically unravelled it throughout the day. Wow. School is doing great things for that child. 7) Moisturise with a few drops of this oil. Sorry. I realise this is in Czech. Um. It's called Ylang Ylang oil. 8) Use dabs of this very strong ointment for bad spots of acne. CAREFUL! This stuff is super drying and bleaches fabric. I don't mind if it bleaches my pillow or the old T-Shirts I sleep in, but you might wanna be careful. I am actually going to hop off and go implement this routine right now.